The popularity of the term ‘Google it’ has turned the noun of google into a transitive verb - one we utter it so often that according to The American Dialect Society was the most useful word of 2002. It was entered into the Oxford English Dictionary and Merriam-Webster Collegiate Dictionary in 2006 as an actual verb - an action we’ve all come accustomed to as the answer to every argument and question. I've found myself annoyed in the past with just about any other search engine forced on me by the various browsers and wifi programs I use, that is, until I was sent a browser which aligned ethically with my morals and I effectively changed that verb from ‘google it’ to ‘Ecosia it’ in a matter of hours. 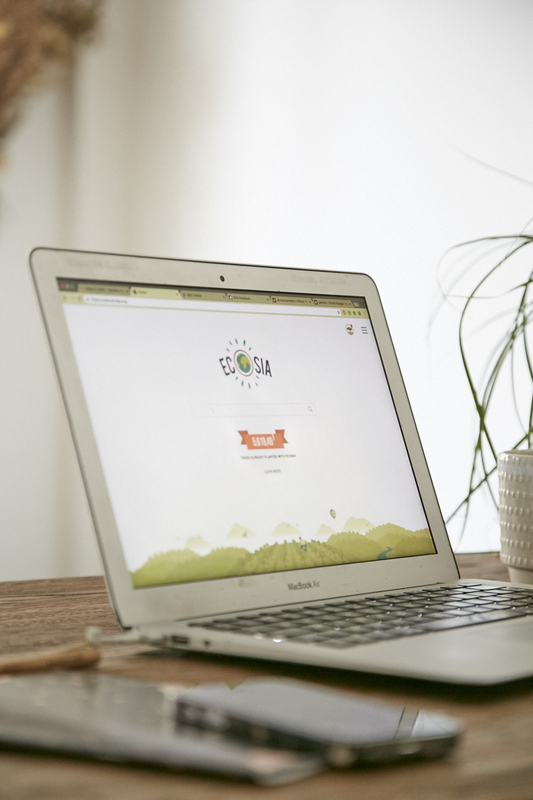 Ecosia is a browser which empowers all us tippy typers to make a small difference in the world through the powers of our internet obsessions, enabling us to support the environmental, social, and economic sustainability of the planet with each search we do. It mimics Google’s visual experiences and functionality in terms of everyday use, with an earthier logo and a small thumbnail of trees with a notification esque counter in the top right corner taboot. It’s no secret that search ads generate income for search engines, things like Google’s Cost Per Click ads generate $0.01 to $100+ per click depending on the advertiser, paid with their revolutionary advertising model which is based solely on performance (when someone clicks on the advertiser's ad). Ecosia makes its profits the same way, but rather than hoarding the lion’s share, they donate 80% of revenues to planting trees instead. According to their website, it costs 0.28€ to plant a tree and as I write this article they’ve donated over 2,885,663€ resulting in 5,595,881 trees planted in total. Their ambition is to plant one billion trees by 2020 in a bid to fight climate change making this perhaps the most passive form of activism I’ve yet come to know. In all aspects of the eco and ethical world, transparency is key, which is why Ecosia publishes monthly donation receipts with their planting partners and also makes public monthly business reports so you can keep up to date on what you and your fellow Ecosia browser buddies have accomplished for the world and its chosen communities. They were the first company in Germany to become a B Corporation due to their social business model. Deforestation is a huge part of the climate change situation. Trees absorb CO2 (which is omitted by fossil fuels) and at the moment, we’re omitting and as of October 2016 we were at 401.57 parts per million, which is an increase of more than 40% since the start of the Industrial Revolution, which for the 10,000 in which this world existed before the mid-1800s, didn’t move above around 280 ppm. Trees are the ultimate creation in terms of design; they make oxygen, sequester carbon, fix nitrogen, distill water, provide habitat for hundreds of species, accrue solar energy’s fuels, makes complex sugars and food, change colours with the season, create microclimates, and self-replicate … yet we cut them down for profit. These magical living things also provide food and other products which can be sustainably harvested. Worldwide, the livelihood of 1.6 billion people depends on forests. Forests also regulate the water cycles and prevent floods. They create monstrous microclimates and increase groundwater levels, acting like a sponge and thus preventing droughts. Their partnerships with not for profits span across the world, telling tales of hope and reconstructing what was stolen in the name of monetary funds. In San Martin, Peru, and area heavily deforested in the 1980s before it became a red zone of coca production is now establishing new sustainable income models with Ecosia’s partner Pur Project. The island of Madagascar has already lost 90% of its forests is being supported by Ecosia partner Eden Reforestation Projects which is hiring villagers to replant the forests so the wildlife can return while also putting a stop to soil erosion. In Burkina Faso, the Sahara desert is rapidly expanding south and making survival very difficult for people in the Sahel area. Ecosia has also partnered with OZG in Burkina Faso which is working to stop the Sahara desert which is rapidly expanding south by germinating during the rainy season with drought resistant trees which will make the land fertile again and gradually bring back to life and economic opportunities to the region. 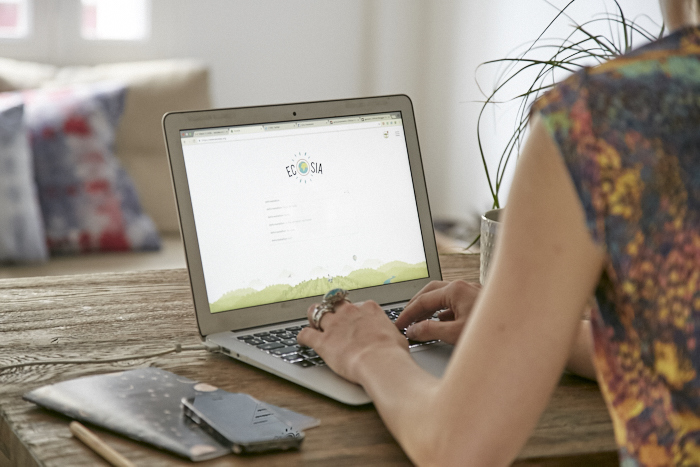 Ecosia is one of the easiest sustainable switches to make, all you have to do is change your search engine by clicking THIS LINK and press the 'add to (browser)' button and then get on with your day in the usual way. You can find out more about ECOSIA on their website, HERE. SPONSORED POST: This post is sponsored. I only work with brands if their morals on ecology and ethics align with mine and if I do / will genuinely use their products as a part of the green lifestyle I'm doing my best to live. 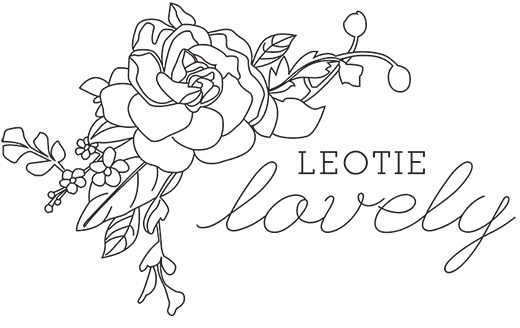 In the spirit of giving this company has displayed I too have donated 80% of the profits from this post to their partners to plant trees on my /our behalf.